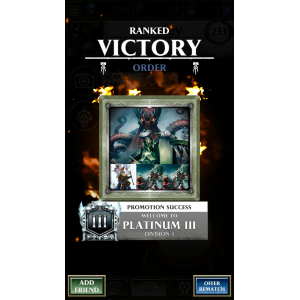 Last night I hit Platinum with a version of the Aelf deck that I have been playing since Warhammer Champions launched in August. It has been quite the journey. Insert obligatory self-gratifying image. Only a week ago, I thought that competitive success with the Aelves was impossible. The Aelf units rely significantly on Lotann’s ability to be effective, and having all-Beast or all-Aelf draws simply tanks a game. An opponent who knows how an Aelf deck works will remove your key Beasts and watch as you flail around. Going with the “full theme” Aspect of the Sea leads to even more inconsistency, with a mix of Spells, Beasts, and Aelves that have to be drawn in the perfect order to avoid unplayable cards. It just seemed like the deck would never work. Until I asked a fundamental question. What is an action actually worth? Here is the thing about value; out of the gate, you probably have a decent understanding of which plays every turn are the best. Spoiler alert: it’s the ones you do. Removing a unit that is on its final corner is probably not the right play if you can remove a unit that is about to do 6 damage to you. There is an intuition that most of us hold to when playing out our turns. That intuition is right most of the time, but relying on it exclusively leads to a less-than-ideal assessment of your performance. Most players stick to their intuition, start losing games, and then decide that 1) they need to net-deck a better build, 2) they are unlucky or their opponent is lucky, or 3) the game is broken. This is not the way forward. Instead, that intuition needs to be refined through a careful analysis of exactly what is transpiring during a game. You must be certain that every single choice you make not only feels correct, but is correct. In Champions, with no resources and a limit of 4 entities on the board, the main thing being managed is actions. If I use my actions more efficiently than you use your actions, I should win the game. And though it can be incredibly frustrating at times, that should is actually very important. Because card draw and blessings are randomized, you might play your best possible game and still lose; luckily, this keeps Champions from being a purely mechanical experience and introduces the necessity for players to take risks and throw hail marys from time to time. In order to use actions efficiently, we have to have a framework for understanding what every action is worth. For me, this starts with two assumptions: every card costs an action to draw and an action to play. Take the Paladin Decimator, for instance. This unit is giving me 6 damage for 2 actions (1 to draw, 1 to play), or 3 damage per action (DPA). At this rate, I can win a game in 10-12 actions. 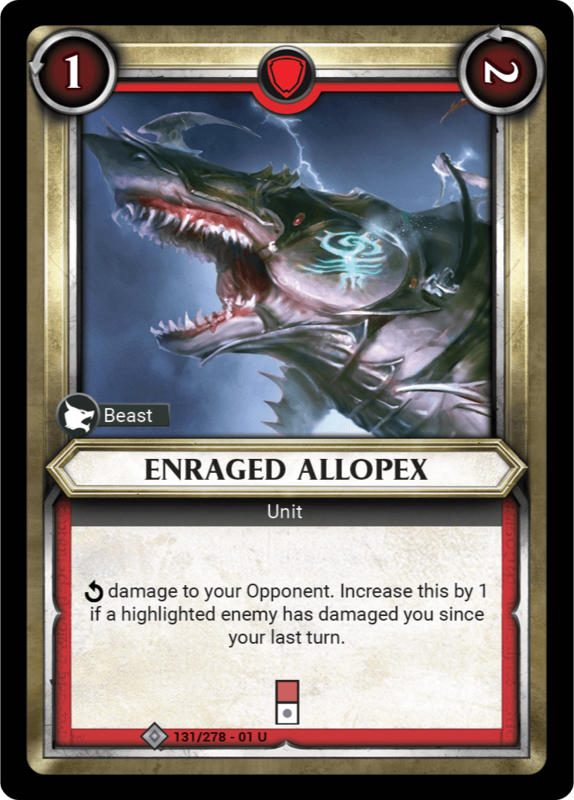 Similarly, let’s look at the Enraged Allopex. This unit, absent its ability, is giving me 3 damage for 2 actions, or 1.5 damage per action. That is HALF as effective as a Paladin Decimator. If I play it across from a unit that does damage to me, it upgrades to 5 damage for 2 actions, or 2.5 damage per action. Still not as effective as a Paladin Decimator. But wait! As many of you may have noticed, the Decimator takes 4 turns to land its damage, while the Allopex only takes 2 turns. This certainly does matter, but let’s just disregard it for now. Next up, let’s look at some more complex interactions specific to an Aelf deck. 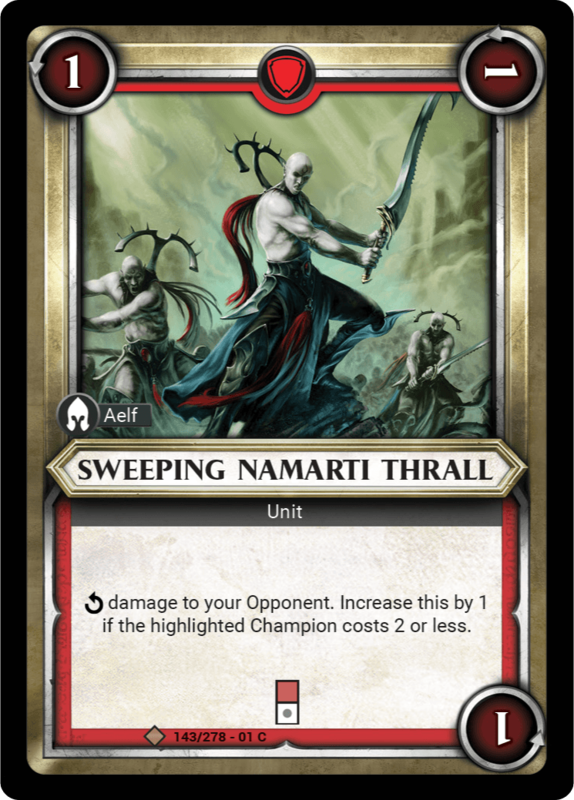 Suppose I play an Aetherwing Scout on Lotann and play a Namarti Soul Feeder next door. That is 4 actions (2 draws, 2 plays) that ends up doing 10 damage – 3 damage from the Soul Feeder, +3 damage for the Beast bonus, and 4 damage from the Scout (assuming it gets used one more time). 10 damage, 4 actions, 2.5 damage per action. After all of that conditional synergy, still not as good as a Decimator. If the Soul Feeder triggers its effect? 3 damage per action. Even more conditions to be as good as a single, bread and butter unit. When I realized this, it changed everything. Let’s keep going. 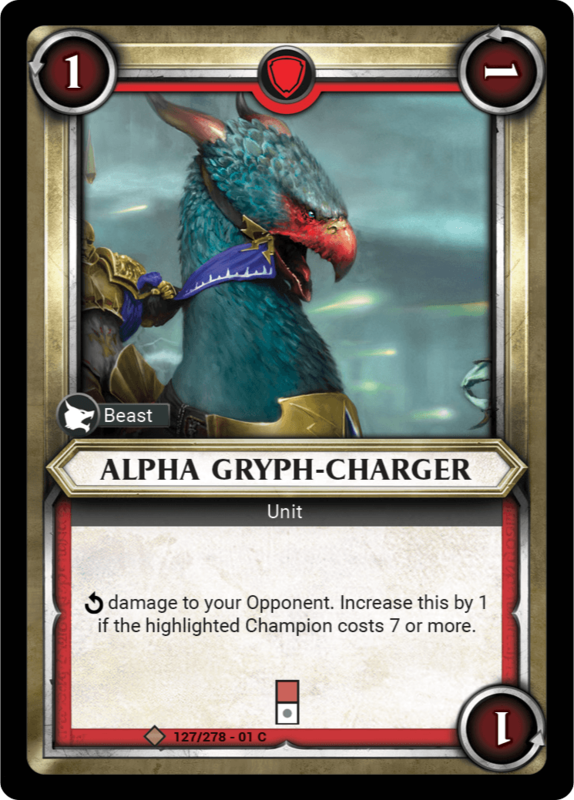 How about Alpha-Gryph Charger on Lotann, with Sweeping Namarti Thrall next door – both across from 5-cost Champions. That is 4 actions for 9 damage, or 2.25 damage per action. Not even close to Decimator level. But what happens if we put both of them across from their ideal targets? Alpha-Gryph Charger now does 6 damage, Sweeping Namarti Thrall now does 9 damage. That is 4 actions for 15 damage, or 3.75 damage per action. That is the kind of synergy that is actually worth it, especially because each of those units is now 3 damage per action regardless of Lotann’s ability. 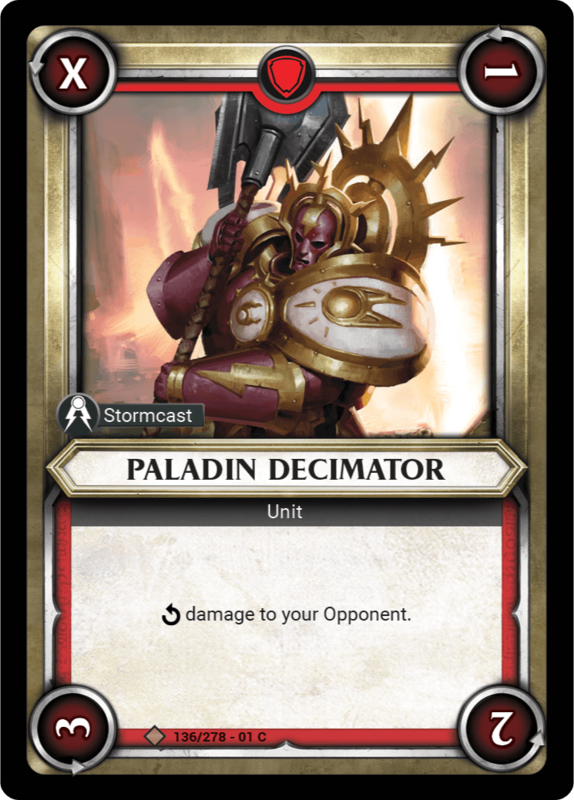 Both units become as good as Decimator when played appropriately, resolve in one less turn, and provide insane damage per action in perfect conditions. Nice. It should be pretty easy to see at this point that synergy does not mean efficiency. I can abuse Lotann and still be getting average or even subpar efficiency for doing so. If Lotann’s beasts are removed? Horrible efficiency. Prevention works exactly the same way – damage prevented is lowering the damage per action of your opponent’s plays. 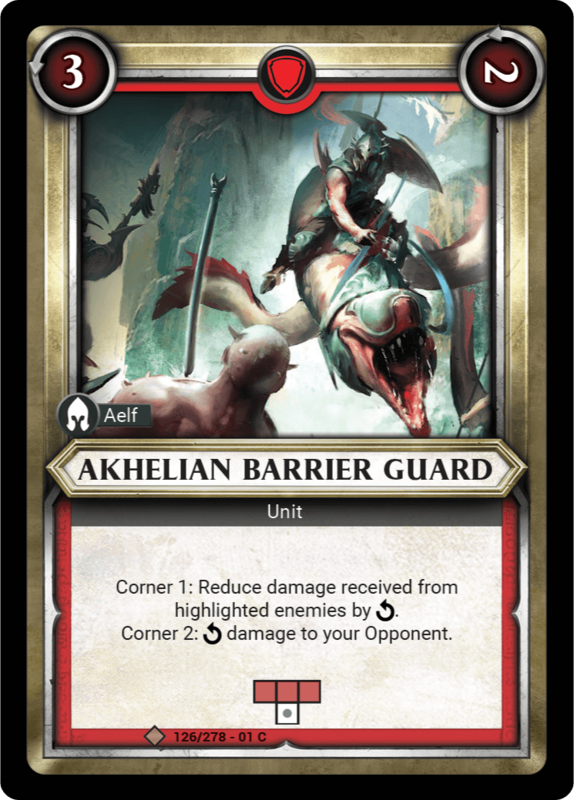 Akhelian Barrier Guard preventing 4 damage (From a Brute Smasha and Scrapper, for instance) and then doing 2 next turn is 2 actions for 6 damage, or 3 damage per action. Next to Lotann? 2 actions for 7 damage, or 3.5 DPA. That’s fantastic. 2 actions for every card played. Divide by total damage done or prevented. Rough evaluation of unit. A framework. 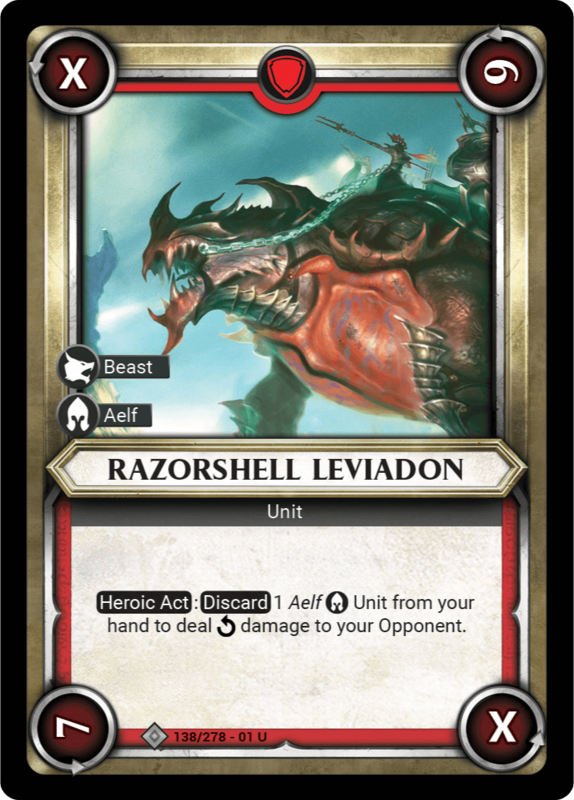 How about Razorshell Leviadon, everyone’s favorite trap card, as a final example. To fully use the Leviadon, you need to draw it, play it, use two Heroic actions, and discard two Aelves. That is a total of 6 actions. If that Leviadon is on Lotann, it results in 15 damage. 6 actions, 15 damage; 2.5 damage per action. All of those conditions, all of the potential for things to go wrong, and you STILL are not anywhere near the efficiency of the lowly Paladin Decimator. So basically, even though the numbers are big and super satisfying, stop making those kinds of plays. Yes there is a case to be made for spiking damage in a short amount of time, but against good players that gets less and less common. With this framework in mind, I started rebuilding the Aelf deck with the goal of getting my average damage per action at or above 2.5. First, the original decklist that took me up and down Silver. I imagine this is pretty similar to most Aelf lists, with a bit of meta adjustment sprinkled in. Mystic Shield was the only way I was able to have a chance against Gordrakk/Destruction, as a board flooded with units often meant Mystic Shield was preventing 9-10 damage. Tactical Formation stemmed from a desire to quest out the Lochian Princes as quickly as possible without losing the hand presence needed to power the Aelf/Lotann synergy (where you are often playing two units on the same turn with no draws). Once I got to Gold with this deck, I simply could not punch through. Chaos fast quest flipped their blessing(s) and did damage too quickly. I ran out of steam against Death fast quest (read: was not efficient enough). Destruction, even with the tech, was still only about a 20-30% win rate. Then the above framework came into play, and I realized I was playing a lot of subpar cards that when combined together became…basically average. I made the following changes immediately. With the new list and damage per action framework, this deck plays very differently. Almost every turn is Celestant ability, play a card. I do not rely on Lotann’s ability whatsoever – if I get a few extra damage per game, that is great. Instead, I focus on making the best possible plays without considering Lotann synergy above all else. Jaws of Death and Divine Vengeance are the most efficient “damage per action” abilities that I can play, even though they are very conditional. Celestant helps filter that out. Piercing Shots remain for helping with Lochian questing, even though their efficiency is awful (1.5 DPA). 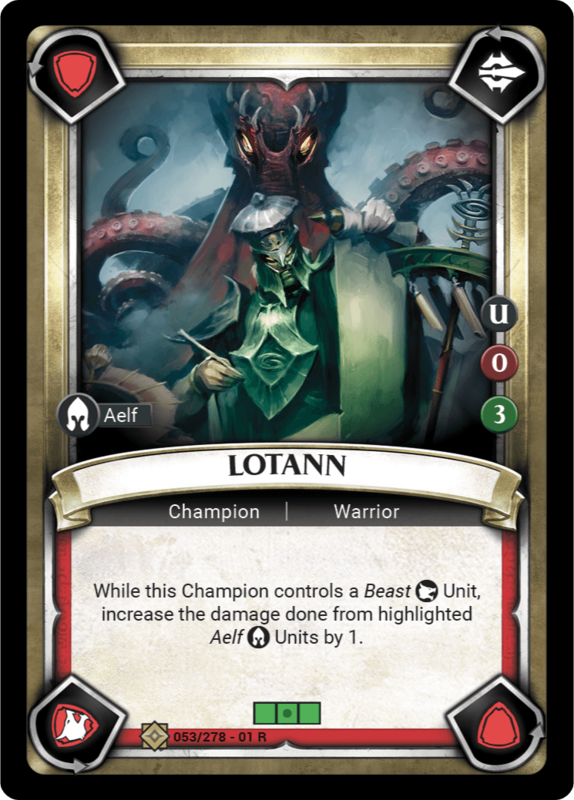 While the Swift Reaver is only 2 DPA, it can be pushed with Lotann’s ability and accelerated, which wins games. A Reaver in hand can be an instantaneous 4 damage when needed, and can empty Blessed Weapons for a surprise win. Every top meta deck has a target for Alpha-Gryph Charger and Sweeping Namarti Thrall. Chaos is on Archaon/Unfettered and Chaos Champion, Destruction is on Gordrakk and Orruk Boss, and Death is on Ghoul King. Those cards are almost always a clean 3 DPA and can go higher with Lotann. If your opponent does not have any Champions in those cost ranges, get ready for a tough game. Barrier Guards and Paladin Protectors provide a fantastic amount of prevention while also advancing your quests. Protector over Mystic Shield allows your prevention to be played on any of your champions, and the “cannot be removed” effect is priceless. Throwing down a Morrsarr Guard to complete a quest and Paladin Protector next to it essentially locks down three lanes and guarantees 6 damage. Beasts can be played anywhere – with Enraged Allopex + Jaws of Death on Lochian Prince being one of the fastest quest completions. Even so, (almost) never play Allopex for only 3 damage. Efficiency reigns. Wait for the right moment. Similarly, do not play Triumphant Smash if you cannot benefit from the backward rotation. This is a critical piece of making your plays more efficient. Get units in place ahead of where your opponent is expected to play (Recruiter, the fast questers on their side) so that your Smash get you the extra 3-4 damage. You will not win without doing this. With this list and philosophy I started winning my games. By making efficient play after efficient play, my opponent’s would jump ahead early and then start sliding behind. Until I got to Gold Division 1. At that point, the fast questing decks started closing and stealing games. I was running into a lot of Chaos, particularly, and their 3/2/2 and +3 if under 15 health blessings were too much. That led to a sacrifice in efficiency in order to answer the meta. The Raptors gave me an answer to decks rushing blessings. By dropping a Raptor in the right lane, I can either prevent a quest completion for two turns or prevent abilities being spammed out of an already-completed slot. With Celestant’s ability to filter for Raptors in the right matchup, this gave me just enough edge to pull out those games. I’m moving in and out on Divine Vengeance, potentially changing to 3x Jaws of Death and 3x Piercing Shot. You simply have to hit your quests extremely fast in this meta, and Divine can clog a hand if drawn at the start of the game. Strike Force Liberators are on the short list as well, as you want them in your opening hand and can filter them out later in the game with Celestant’s ability. 2 actions for 7 damage is the name of the game. One day, Tides of Death will be worth it. It is so close. Hopefully we get a Champion (maybe Aspect of the Storm) who allows the Aelves to flood the board without relying so much on Lotann. As it is, there are not enough unconditionally efficient Aelf units. Obviously, no framework like this is perfect. That is necessary for a game to be compelling. Other factors must be considered – is this getting me closer to completing a quest? Is the time it takes to reach efficiency worth the risk of removal and time in the lane? Am I so far behind that I need to take risks instead of making solid plays by the numbers? Is there a quest right now that would save me if flipped? Even so, having an objective understanding of the damage you are inflicting or preventing with each action you use is critical to both building a good deck and playing it well. It took my Aelf deck from meandering in Silver to joining Platinum, and I hope it does the same for you. Side note, the second set of Champions, called Onslaught, has been announced. With how fantastic this first set has been, I truly cannot wait. Hopefully more Aelves! If you are interested in getting a full playset of Onslaught, we are selling them. I’m splitting one four ways to pick up all of the Order cards in the set for less than the price of a box. Also, if you prefer boxes, we have a Champions Booster Box subscription that is truly phenomenal. Lowest priced boxes, free shipping, near-release day delivery (depending on USPS), and no charge until a few weeks before street date. All of us at Covenant have been playing these kinds of games since we were kids, and designed the subscription offering around what we always wished existed for expandable games. Check it out! Shout out to Zach’s Chaos blog, too, which got me back in the writing mood. He’s also going through some deck building crises right now, so hopefully we get an update soon! And if you see swooley out there in ranked, do not put a 7+ cost Champion next to a 1 or 2 cost Champion during setup! Warhammer has never been my thing. So if I had been walking around Gen Con by myself, I wouldn’t have given Warhammer Champions a second look. The art is exactly as expected for a Warhammer game, the card templating is far from progressive, and PlayFusion is not a company with any kind of notable track record within tabletop games. Overall, the curb appeal is just supremely low for me. I already struggle to keep up with other non-collectible games that I do not have enough time to play, like the Arkham Horror LCG. I also obsessively play another collectible game, Star Wars: Destiny. Having experienced what playing two collectible games at once can do to you mentally and financially growing up, I was not interested in going there again. It does not end well. While Jonathan and I streamed games of KeyForge and Transformers at Gen Con, Steven and Robert cruised the convention hall. One of the first games they brought back for us to try was Warhammer Champions. Almost immediately they sat down to play (pictured above). That night at the hotel room, Steven insisted that I learn how to play. As you might imagine, I had very low expectations initially. When I found myself asking for just ‘one more’ game several hours later, I knew something special was happening. I think we all did, but were we really ready to get into another collectible card game? When I was 9, my mom gave me a Pokemon TCG starter and six booster packs for my birthday. For months, I played the game using just those cards. Almost every time I played, I would see cards I didn’t even know existed. At the time, it was possible to open a booster pack having never seen any of the cards inside of it! The idea of ‘catching ‘em all’ was so implausible, I never even considered it. Many years after my experiences with Pokemon, all of us at Covenant discovered living card games (LCG). For $15 a month, everyone could own everything. That was pretty appealing, especially after years of playing collectible games with the limited budget of a teenager. By the time Star Wars: Destiny came out a couple of years ago, owning everything had become the expected way to engage with a game – and since I was no longer a teenager, why not? When Champions entered the mix, I had a tough decision to make. Fully collecting two games just was not feasible, but I did not want to miss the boat on what seemed to be an incredibly exciting development in the genre. So instead of passing wholesale, I started questioning whether or not owning everything was the best approach. Growing up, I didn’t own everything. I dreamed of owning cards, but I was forced to make good decks using only what I had. Net decking was impossible, because I couldn’t build most of the decks (and the internet wasn’t really a thing yet). Our local meta was completely unique, because everyone had very different and incomplete collections. This situation made every new pack that was opened – by your or your fellow players – a big deal. Cracking the right card or making a big trade could literally break the local meta wide open! Owning everything comes with benefits, of course. It means you can build any deck you want, including the ones that are deemed ‘the best’. If most people own everything, anyone can build any deck. This means when one deck is more efficient than the rest, everyone has access to it. In a way, this is good. When I was a kid, there would be months of time when someone simply had the best deck. Giving everyone access to everything means that this cannot happen, so the meta evolves quickly and a truly “global” meta can exist. Unfortunately, it also has the tendency to destroy the uniqueness of your local meta. Most people don’t have time to grind out hundreds of games (or even a few games) with a deck to make it as efficient as possible, and so they often copy decks from the internet. This prevents players from losing big all night and allows them to have a better time during play, but can also lead to everyone playing against the same, super efficient decks and cards over and over and over. If most people show up to an event with similar decks, one of the biggest original upsides to playing a big, expandable game is gone. Interestingly enough, this is one of the reasons that Richard Garfield, the designer of Magic the Gathering, was compelled to create KeyForge – marketed as a “unique deck game”. At the FFG In Flight Report this year, he mentioned that he never planned or expected anyone to ‘own it all’ and that he felt a lot of the intended energy of the game was lost because of it. The announcement of KeyForge was fresh on our minds when we started discussing whether or not we wanted to get into Warhammer Champions. Then, suddenly, the idea seemed to hit everyone all at once: what if we played this game like we used to play card games? What if instead of buying everything, we did our best to recreate that sense of excitement and imperfection that we had experienced as kids? Over the next few days, a plan was hatched. The four of us (Jonathan, Robert, Steven, and I) were going to each grab a different starter and sign up for a single booster box subscription. Any time a new set released, we would split a box into our four factions and play the game using only those cards (mostly). For roughly $20 a set, we could play Warhammer Champions almost exactly like we used to play collectible games as kids! Of course, we conceded that we would miss out on the open constructed environment – as our imperfect decks would likely get trounced. But we would get to experience the game in our own way, with a totally unique meta to us. This simple idea still gets me more excited than I have been in a long time about a card game! So much so that I am now writing a blog about my Chaos deck. In my time playing the Conquest LCG (most of my exposure to the macro Warhammer universe), I was drawn to the mechanics of Chaos – so that is where I started. After a few games, it was clear that I had made the right choice. I play Kylo Ren in Destiny, so… yeah it makes sense. When I first started browsing through all of the Chaos cards in the starter, the first thing that stuck out to me was how many of the units remove one of my own units. At first, I couldn’t see how this was good at all. Over time, I started realizing just how important this was to my faction. Chaos has a lot of units with Last Stand effects. These abilities trigger whenever a unit is removed, even by your own units or abilities. For example, the Gore-Slick Skullreaper (pictured above) does 2 damage to your opponent when he is removed from play. This disincentives your opponent from removing him, since they will take damage when they do. It also increases his damage output from four to six total damage, assuming he makes it to his last side and is then removed. Removing your own units has the added benefit of clearing the way for other units to be played. This doesn’t seem extremely useful initially, until you start to understand both questing and lane position. Chaos can move through units faster, increasing the speed at which they do damage over the course of a game. This also allows them to get to their blessings faster, since many of the Chaos champions require playing a unit to complete an objective (the icon on each corner of a champion). Working with our very small card pool, I started building my first deck by putting aside all of my cards that remove a unit or have Last Stand effects. From there, my choices were relatively limited. There were several days where I swore off wizards, since they can’t play units (unless they are a Warrior Wizard) and they can’t play abilities if they have a spell in play. The more I leaned into removing my own units though, the more I realized I typically had at least one slot on the board that was empty. This led me to put a wizard back in and my win rate went up dramatically afterward. Below is my initial deck list, working from a starter and about 10 booster packs worth of cards. One of the unique things about building a deck with such a limited card pool is how many different cards and themes you get to explore. You’ll notice I have a lot of one of cards. While this isn’t atypical of my constructed decks in other games, in this case it is simply because I am using what I have and actively trying to explore the various aspects of Chaos. There are a lot of cards I would absolutely include if I had three copies, like Blood Hunt and Gift of Change. However, being limited to two of each of these meant that I included cards I probably would have glossed over otherwise. A great example is Mystic shield. When we first started playing, this spell seemed alright. As I start playing against more and more experienced players though, they tend to stack up multiple turns where I am being damaged several times a turn. I have had a single Mystic Shield block more than ten damage, which is enough to completely turn the tide of a game. We were just charged for the first set reprint through our booster box subscription, so we should have our first booster box within the next two weeks! In my next blog I will be talking about the cards I got and my initial decks lists. I am hoping to explore the various themes of Chaos and potentially even a double wizard deck. If you are hesitant to try the game (like I was), don’t be! This game is incredible. We just posted our Learning Champions series, where we cover everything you need to know to decide if this game is right for you. You can also try the game by downloading the app or grabbing a Campaign Bundle, which includes four fully playable decks. Seriously, give this game a try! And if you are concerned at all about trying to keep up with another game, consider taking the more casual approach that I have outlined here. I love having everything available for all of those deckbuilding options, but I have to say – this past month with Champions has been incredibly refreshing. If you would like to learn more about our Champions Booster Box Subscription, check out its dedicated product page or leave a comment below. All subscribers are charged minimum advertised price (20% off) a few weeks before a new set releases, and every subscription ships for free. Unequivocally better than a pre-order!